Mayor Briley just seconds before he signed the executive order to invest $750 million in affordable housing over the next ten years. NASHVILLE, TN — Mayor David Briley announced a $750 million affordable housing initiative Tuesday, the largest such investment in the city’s history. Dozens of housing advocates, city officials, and dignitaries surrounded the mayor as he spoke in the sunny courtyard of the newly constructed Kirkpatrick Park MDHA townhouses in East Nashville. “Today we are making a $750 million-dollar commitment including $500 million of public money that will that will create more than 10,000 units of affordable housing here in the next ten years,” Briley said to loud applause. 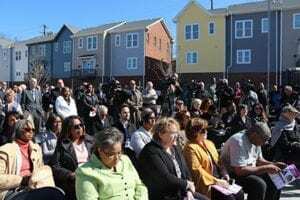 Advocates, low income residents, non-profit builders, MDHA officials, and city council members heard some good news about an unprecedented investment in affordable housing. affordable housing costs $75,000 to build. Non-profit housing developers say it currently costs about $150,000 to produce one unit of affordable housing in Nashville. A more realistic number of new units under the new initiative is more like 5,000 not 10,000. Nevertheless, the Mayor’s investment in low income housing is historic considering about half of the city residents spend more than 30 percent of their monthly income on housing. The Mayor said MDHA would get $350 million to help the agency’s mixed-income developments like Kirkpatrick Park and add 5,000 new units to MDHA”s portfolio of some 18,000 affordable housing units. Briley said the Barnes Fund, a pot of low-income housing money, would get $150 million over ten years, or $15m/year, which represents a 50% increase. But even that number is considerably lower than what cities like Austin, TX, Charlotte, NC, Minneapolis, MN, and Seattle, WA. put into their versions of the Barnes Fund. Briley also announced $250 million in matching funds to spur more investment by the private sector in affordable housing. The mechanism to do that was not spelled out but involves the creation of an affordable housing Real Estate Investment Trust (REIT). One recent public-private scheme to develop workforce housing was the Housing Incentives Pilot Program (HIPP). It was designed to motivate private developers to build mixed-income housing in the urban core. The architect of the HIPP program, Matt Wiltshire, said it didn’t do well because he couldn’t recruit enough private partners. Briley has picked Wiltshire to be MDHA‘s new chief strategy officer. “Matt know how to bring government and the private sector and nonprofit leaders together to get things done and I know he will do that as MDHA’s new chief strategy officer,” Briley said. “I know how critical it is that we invest in Nashvilians, that we invest in helping our people stay in the city rather than getting priced out of the city. We are calling this ten-year effort ‘Under One Roof 2029’,” he said. The mayor’s plan to build mixed-income communities in the core of the city, while admirable, may be way too little way to late. Housing developments downtown and along Charlotte Avenue, Jefferson Street, and along the Cumberland River into Germantown, are pretty well developed with market-rate housing already. “It is fundamentally important that we build mixed-income communities that bring people together in one place. Data show that people who live in mixed-income communities will be more successful in the long run,” Briley said. “We as a city must be about the business of de-concentrating poverty and that’s what the first $350 million is all about,” he said. Briley said the $150 million investment in the Barnes Fund it will help nonprofit organizations build more affordable housing in the city. “Today is game changer not just for MHDA but for the Nashvillians who were worried about their place in this city,” said MDHA Board President Charles Robert Bone. “The opportunity to accelerate the Envision Process will increase affordable housing for those most in need but also allow us to do that in a way that de-concentrates poverty. 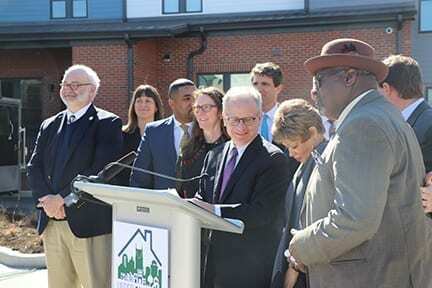 This overall investment is the largest local commitment to affordable housing in our city’s history,” Bone said. Bone said it took MDHA more than 80 years to acquire 5400 units and that the city’s investment will add 1,000 units to MDHA”s portfolio in short order.